The first and only nap timer app for BlackBerry smartphones! Are you tired of setting the main alarm and then having to remember to reset it later for the next morning when you just want to take a short power nap? Do you wish to simply press a big button and rest easy? Your prayers have been answered, NapTime is here! NapTime features multiple big buttons with quick alarm times ranging from 10 minutes to 2 hours. Simply press one of the buttons and an alarm will immediately start. Easily reset or cancel alarms with the quick push of a button. When the nap is over, just exit the app. No more setting, resetting, or even touching your usual alarm. Do the preconfigured alarms not fit your needs? 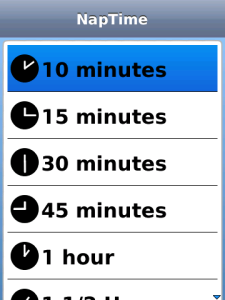 Try the Custom option, where you can quickly create a one time alarm of the duration of your choice. A settings menu allows you to change the ringer and volume for the alarms. According to a study featured in the New York Times, napping can actually restore the ability to learn. In addition, it increases performance and retention rates of information. So go on, get some rest, its nap time!